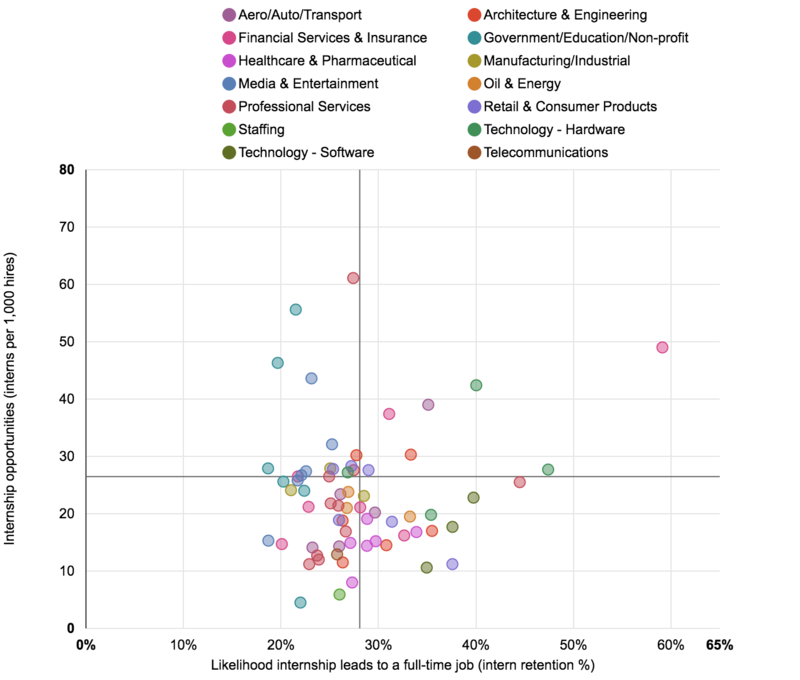 Which industries offer the most internship opportunities? 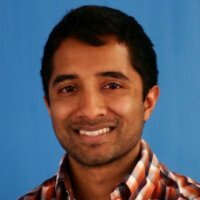 How often do those internships lead to a full-time jobs at those companies? Below, you can see the results of our analysis. The x-axis represents the likelihood that an internship will lead to a full-time job at the same company, and the y-axis represents the availability of internship opportunities. What does this all mean? Well, it appears that some industries have a ton of internship opportunities, while others have barely any at all. For example, 61 out of every 1,000 hires made in the Public Relations/Communications industry are interns. Compare that to the Education Management industry, where only 5 of every 1,000 hires are interns. Additionally, some industries are much more likely than others to offer full-time jobs to their interns. Almost 60% of members who interned at companies in the Accounting industry accepted a full-time job at the same company in the year following their internship. Compare that to companies in the Mining and Metals industry, where only 21% of interns take a full-time job at the same company a year later. Getting an internship anywhere can be a valuable experience. According to Bloomberg, 61% of students who had an internship also had a job offer by the winter of their senior year. Beyond the obvious benefits of getting your foot in the door and learning relevant skills, it’s a crucial opportunity to grow your professional network on LinkedIn by connecting with your managers and colleagues. If you’ve got your eye on a specific company you’d like to work for in the future, and they’re in one of these industries, landing an internship may be the best path forward. These industries are likely to offer experiences that are applicable at many companies. Having internship experience may still be valuable when it’s time to apply for a full-time job, even if it’s not at the company you interned in. These industries tend to be really competitive, and hiring managers are likely to rely on a pipeline of top-notch interns to fill full-time jobs. If you manage to get an internship in one of these industries, hang on to it for dear life! Given how few opportunities are available, these industries probably don’t rely on internships as a source of full-time hires. Don’t sweat it if you didn’t get one, as few do. However, if you’re still looking to get your foot in the door, you’ll need to brush up on those networking skills. If you don’t know what industry to work in, consider using our chart as a guide. If you’re simply looking for internship experience, consider an industry in the top half of our chart. If you’re more interested in full-time opportunities in the future, consider an industry in the right half of our chart. If you want more details on career opportunities available for your field of study, or for graduates at your school, check out LinkedIn for Education. As we continue to build the Economic Graph, a digital map of the global economy, we’ll be able to provide students with more information to navigate an increasingly complex and challenging job market. Youth unemployment is one of the most important challenges of our time, and we hope to provide meaningful solutions in the near future. To determine the likelihood that an internship will lead to a full-time opportunity, we isolated members that indicated in their profile that they held an internship at some point in the past, and currently hold a full-time position. Members whose current full-time position is in the same company as their past internship position were considered to be ‘retained hires.’ We then grouped the company data by their respective industries to determine the internship retention percentages for each industry. To determine the availability of internship opportunities, we looked at the population of members who indicated they had an internship in 2013 as a fraction of all hiring activity in 2013, broken down by industry. Only members with English, Spanish, Portuguese, French, Italian, and Dutch language profiles were included in the analysis.